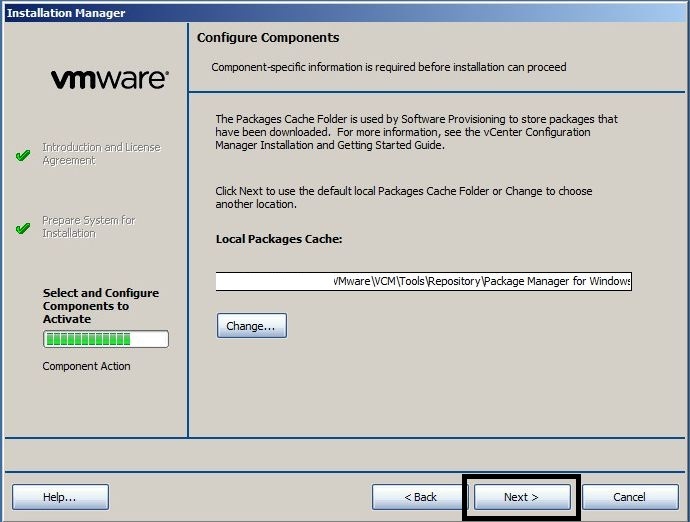 This is part 8 of the vCenter 5.1 to 5.5 Update 1c upgrade, detailing the upgrade and re-integration of vCenter Configuration Manager. 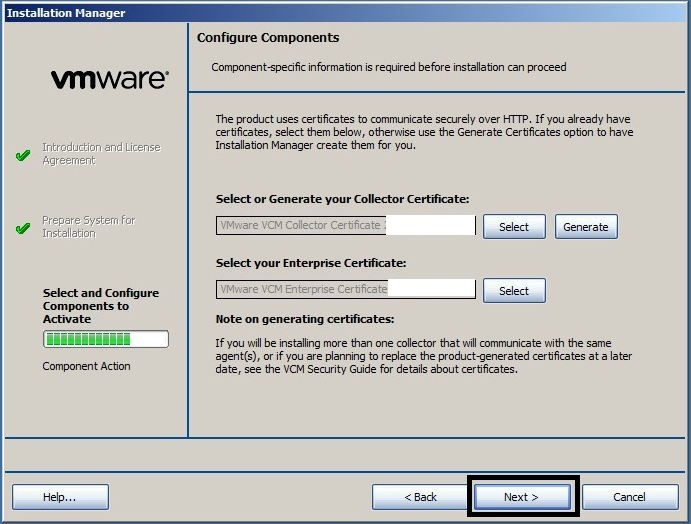 You have a licenced, fully configured and functioning version of vCenter Configuration Manager. 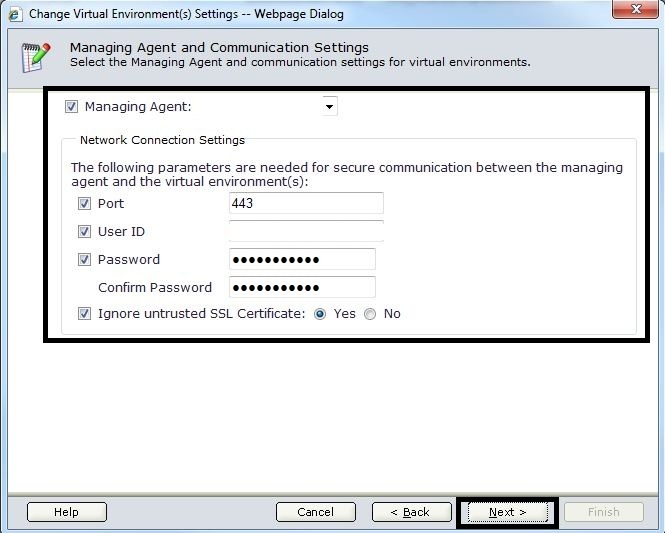 You have administrator access to vCenter and vCenter Configuration Manager. 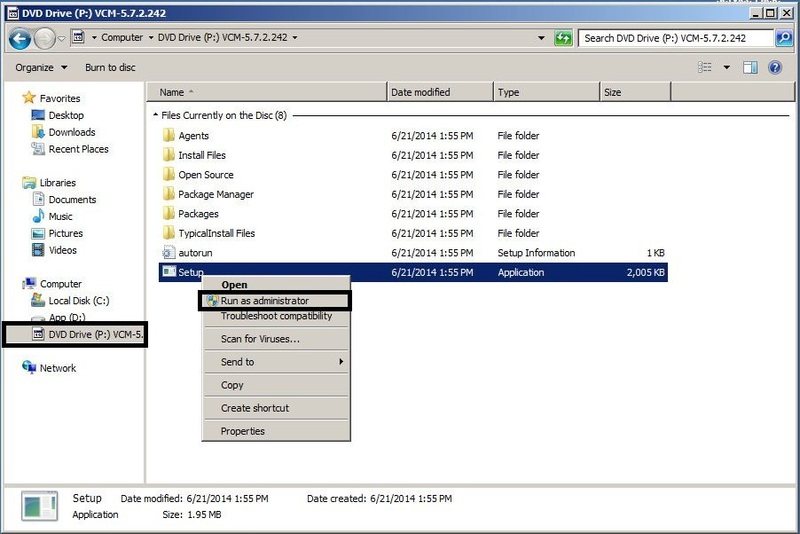 You have have the vCM 5.7.2.242 binaries. 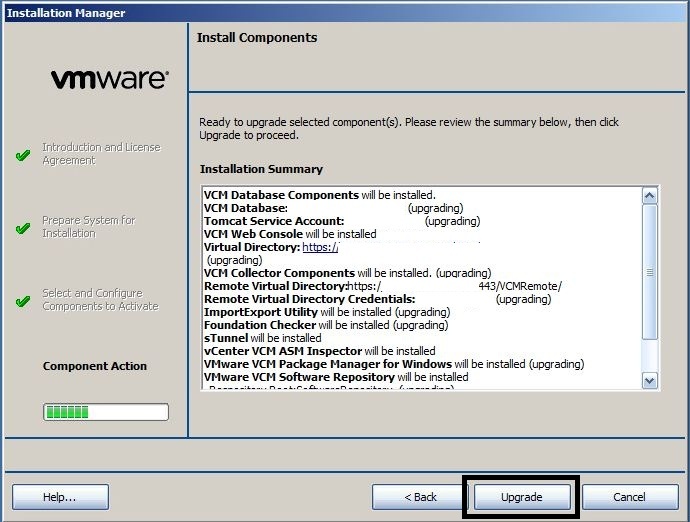 Backup the vCM servers (image level and DB consistent). 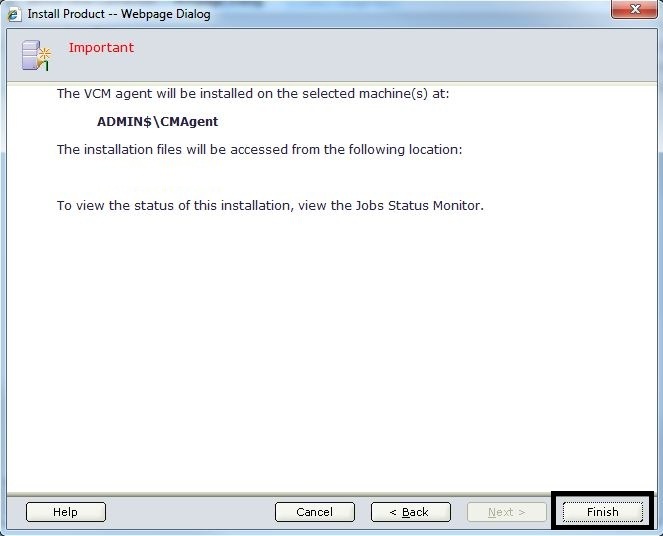 Mount the vCM 5.7.2.242 ISO image to the vCM application server. 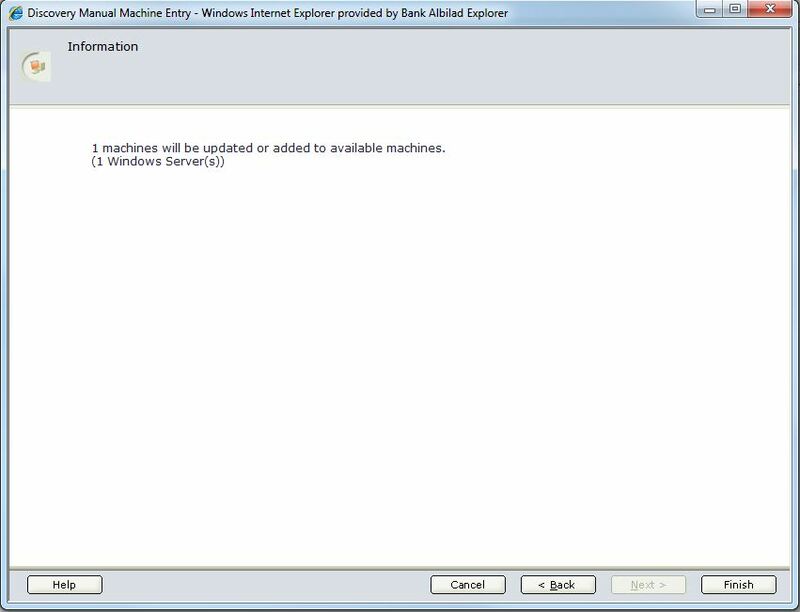 Login as the vCM administrator user and run the “Setup.exe” binary with “Run as Administrator”. 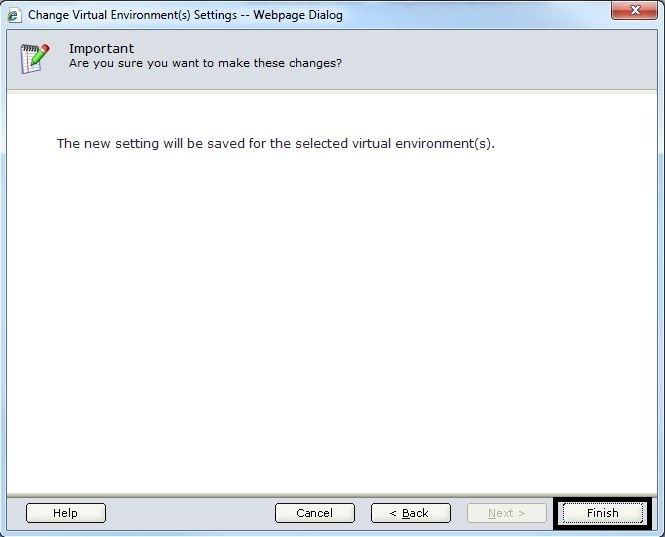 In the “Introduction” screen, select “Upgrade” and press “Next”. 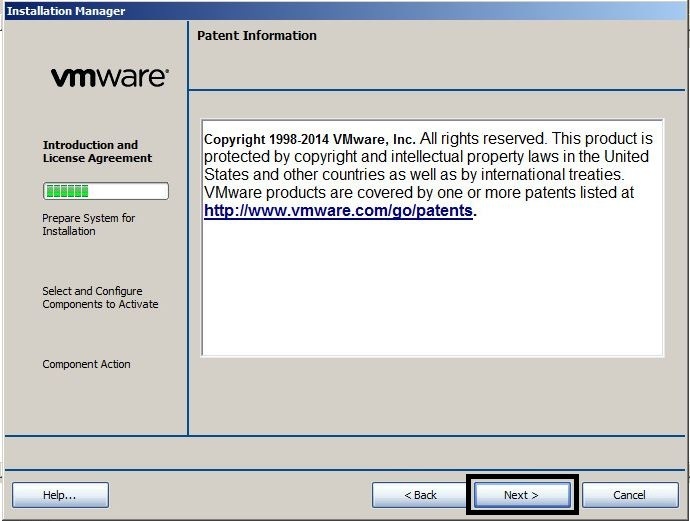 In the “Patent Information” screen, press “Next”. 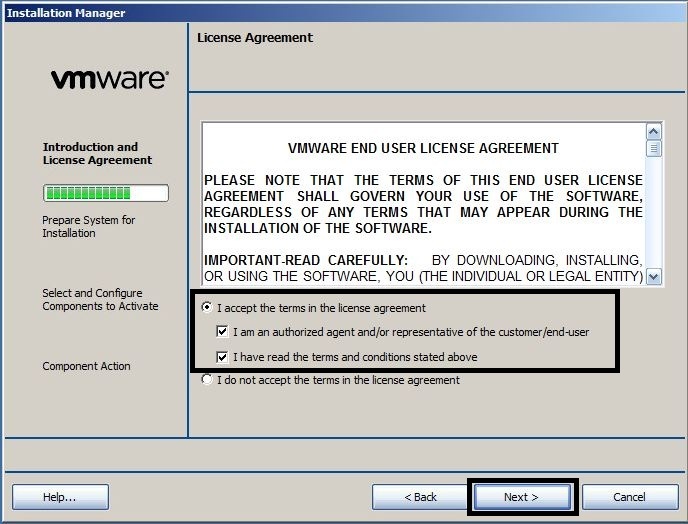 In the “Licence Agreement” screen, accept the three EULA options and press “Next”. 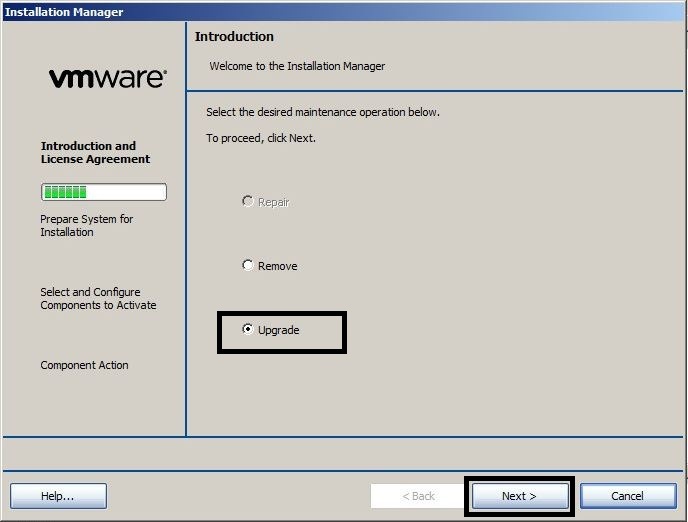 In the “Select Installation Type” screen, press “Next”. 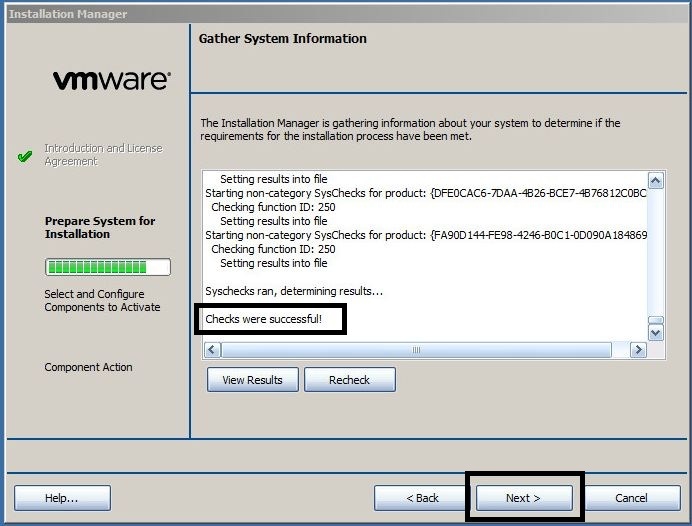 In the “Gather System Information” screen, verify the “Checks were successful!” message and press “Next”. 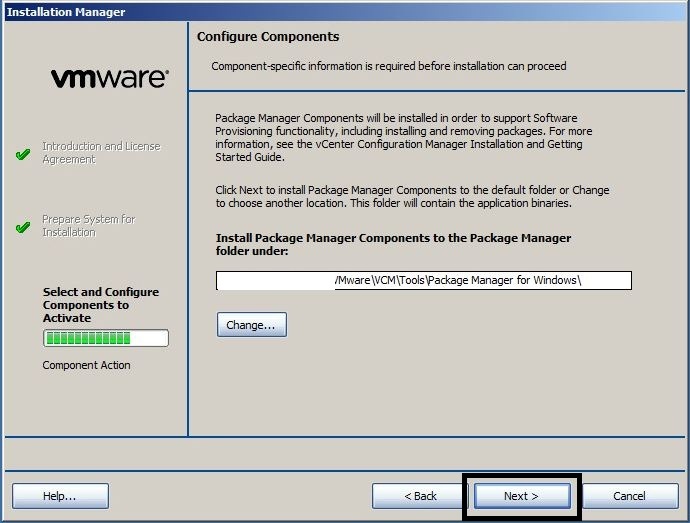 In the “Configure Components” screen, press “Next”. 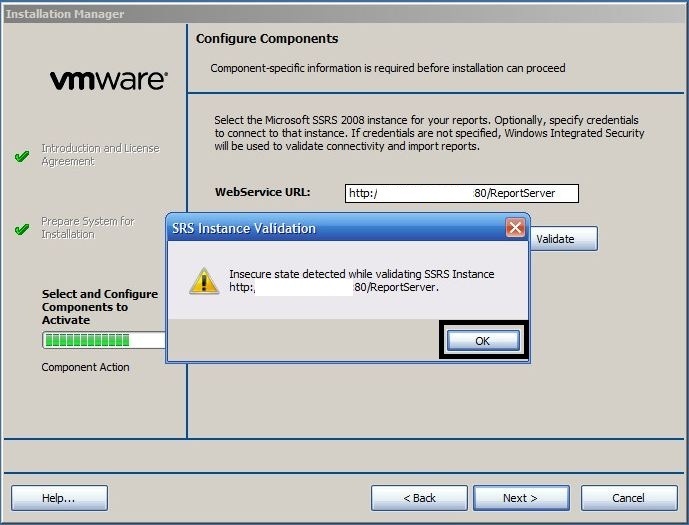 In the second “Configure Components” screen, press “Validate” and press “OK” if the “Insecure state” message appears. Then press “Next”. 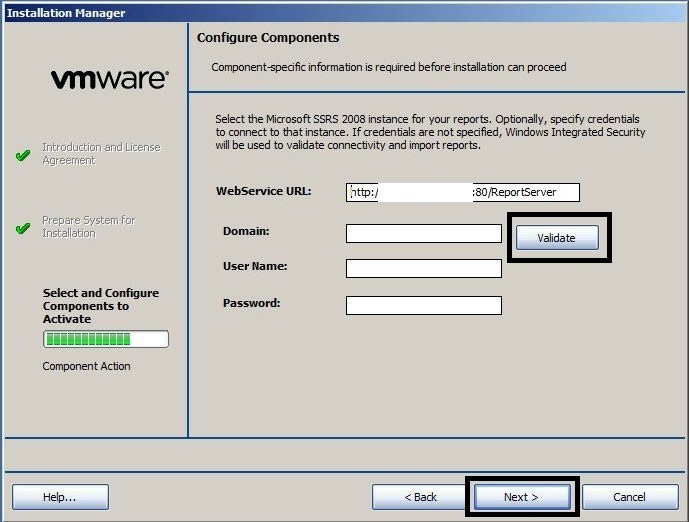 In the third “Configure Components” screen, press “Next”. 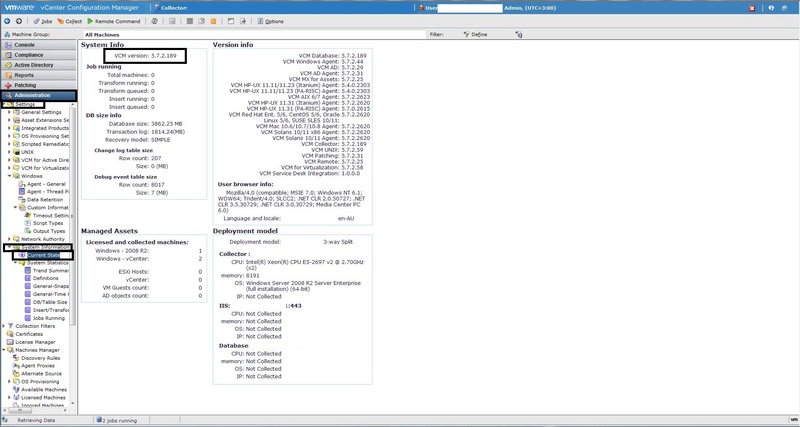 In the fourth “Configure Components” screen, press “Next”. 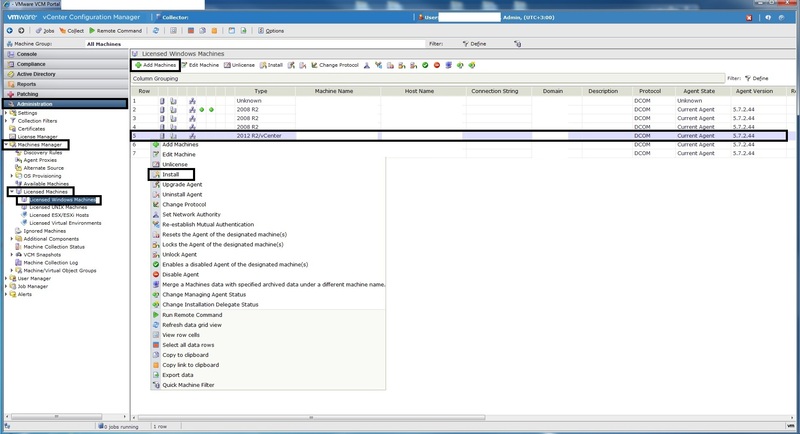 In the fifth “Configure Components” screen, press “Next”. 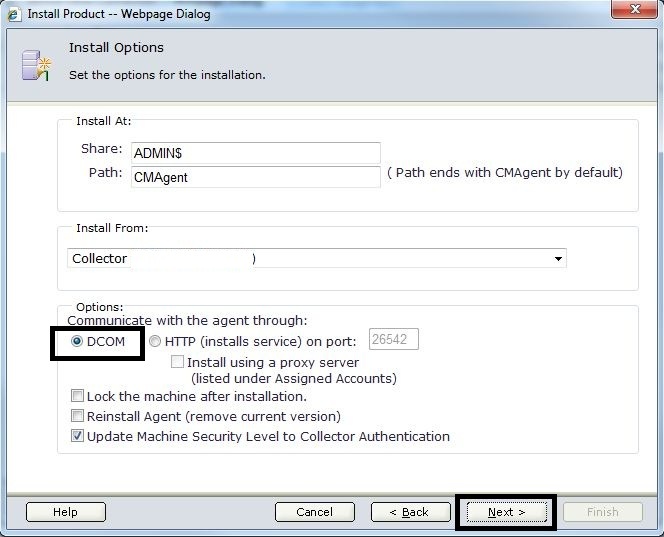 In the sixth “Configure Components” screen, press “Next”. 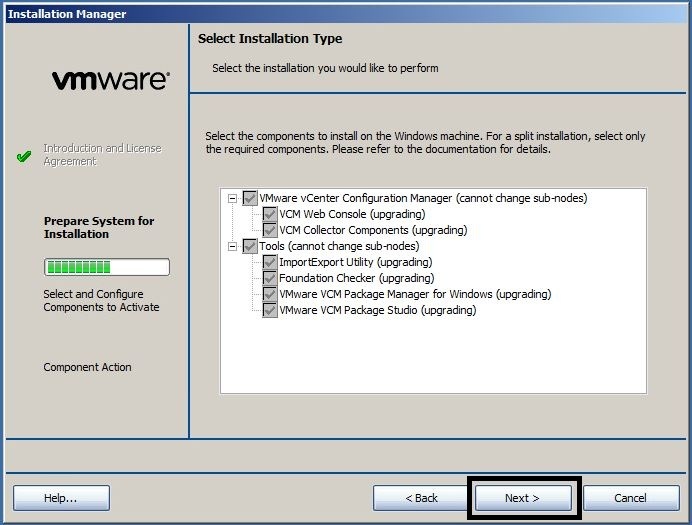 In the seventh “Configure Components” screen, press “Next”. 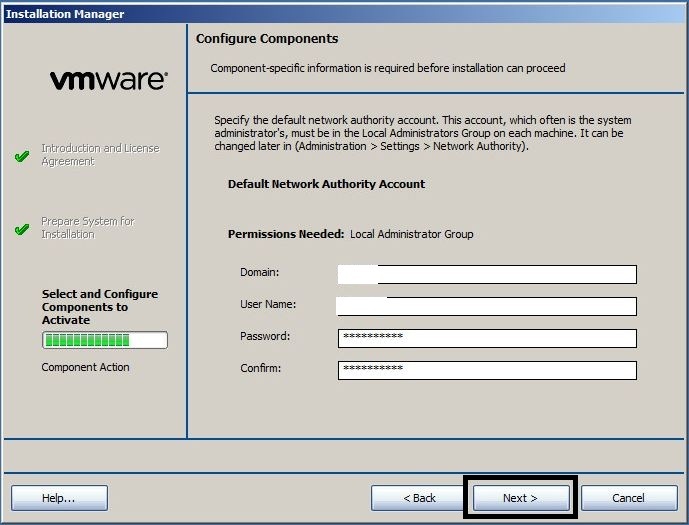 In the eighth “Configure Components” screen, press “Next”. 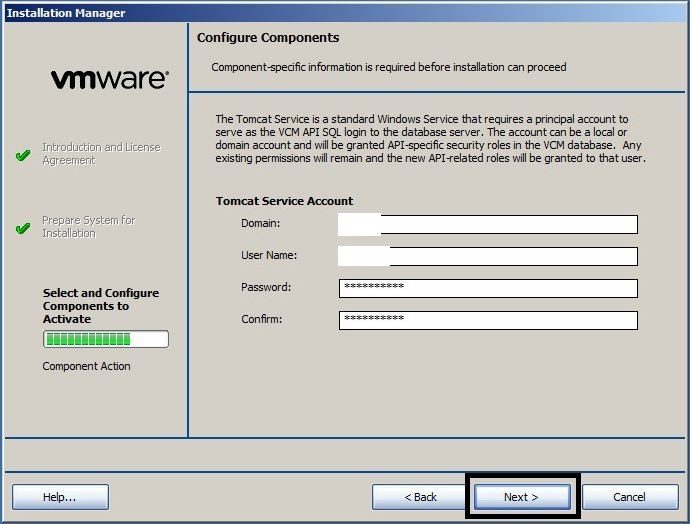 In the ninth “Configure Components” screen, press “Next”. 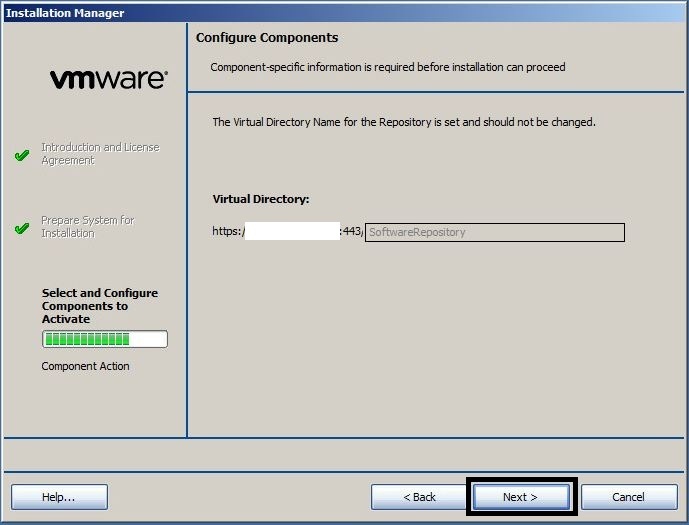 In the tenth “Configure Components” screen, press “Next”. 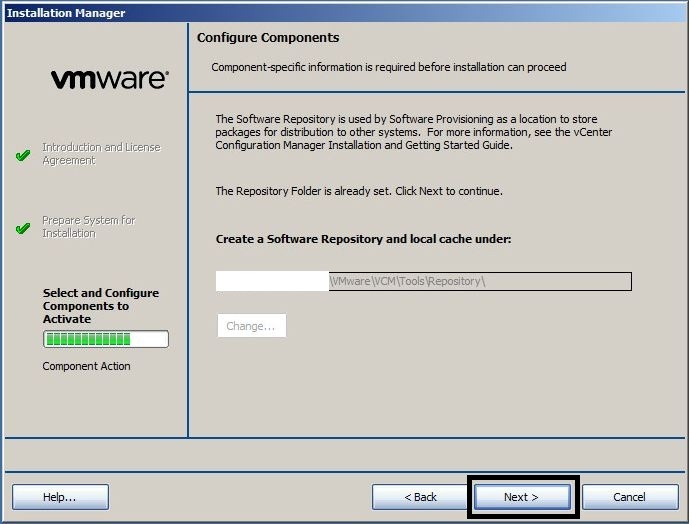 In the eleventh “Configure Components” screen, press “Next”. In the twelfth “Configure Components” screen, press “Next”. 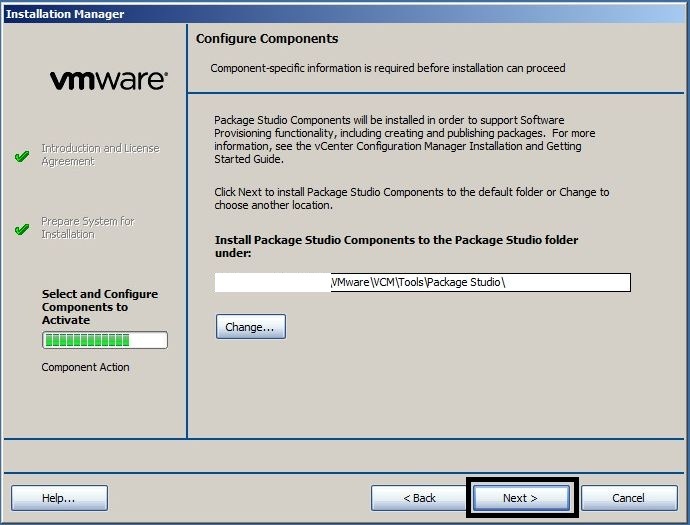 In the “Install Components” screen, press “Upgrade”. 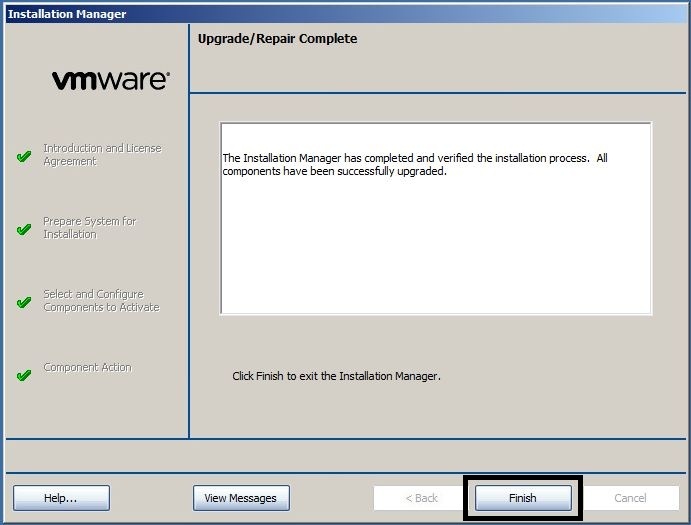 In the “Upgrade/Repair Complete” screen, press “Finish”. 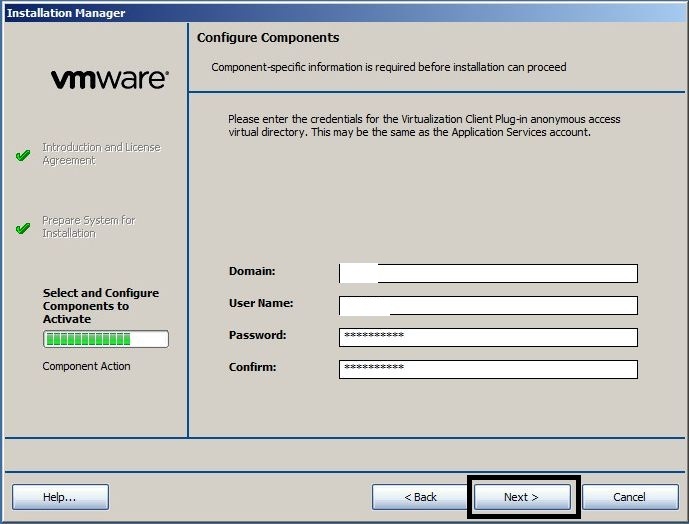 Login to vCM as an Administrator and verify the version information from the “Administration”, “Settings”, “System Information”, “Current State” object. 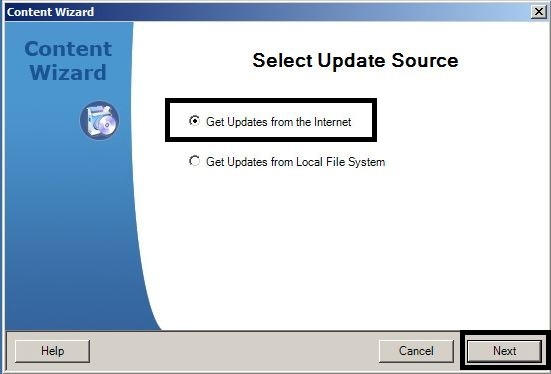 In the “Select Update Source” screen, select “Get Updates from the Internet” and press “Next”. 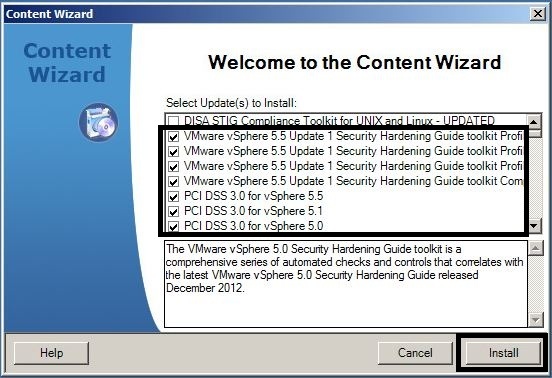 In the “Welcome ot the Content Wizard” screen, select the updates required and press “Install”. If required, enter the Proxy details. 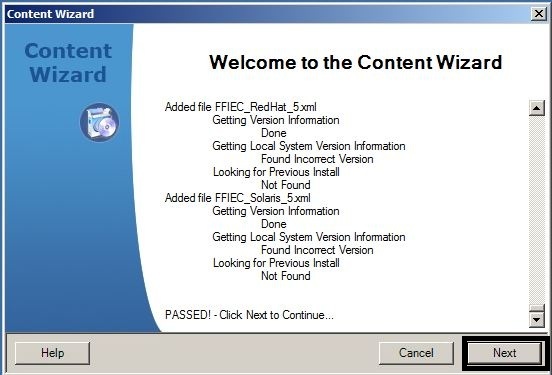 In the second “Welcome to the Content Wizard” screen, press “Next”. 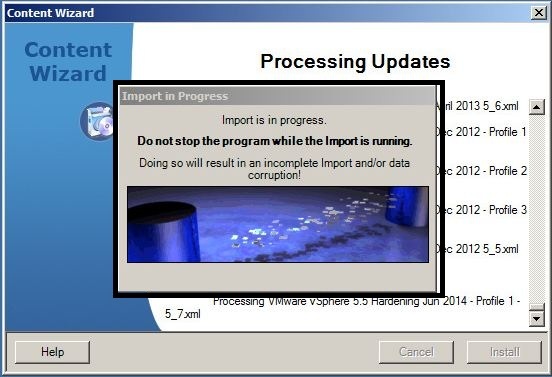 Wait for the “Processing Updates” screen to complete. When the “Event Log Results” window appears, press “Close”. Then press “Exit” on the “Update Finished” screen. 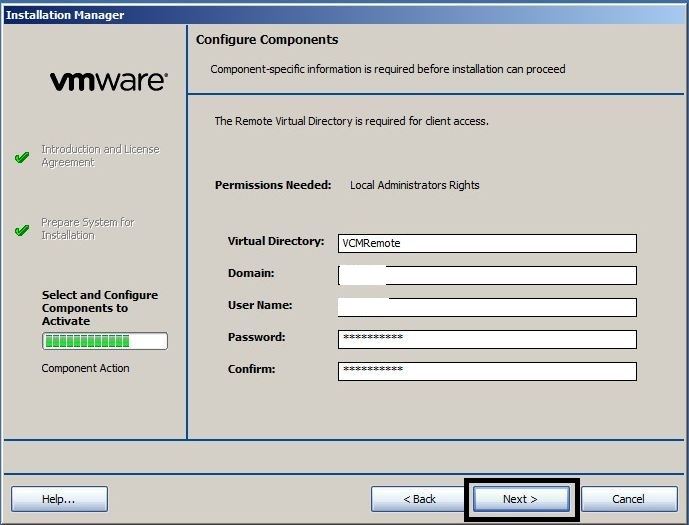 Login to vCM as an Administrator and verify that the updated compliance templates appear in the “Compliance”, “Templates” window. 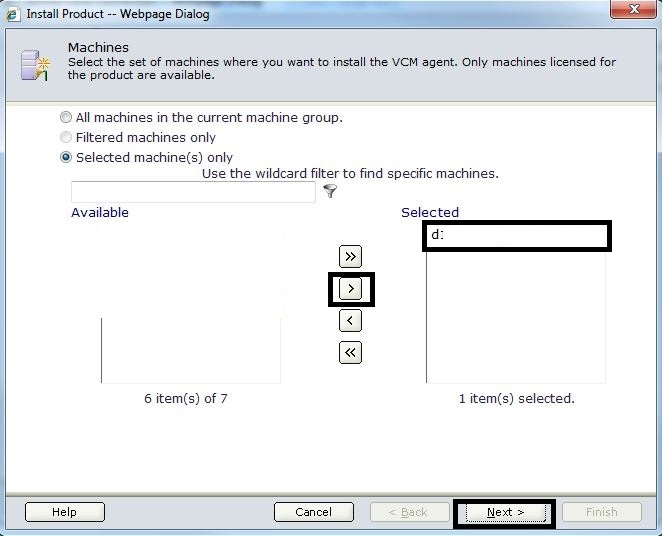 Login to vCM as an Administrator and go to the “Administration”, “Machines Manager”, “Licenced Machines”, “Licenced Windows Machines” section. 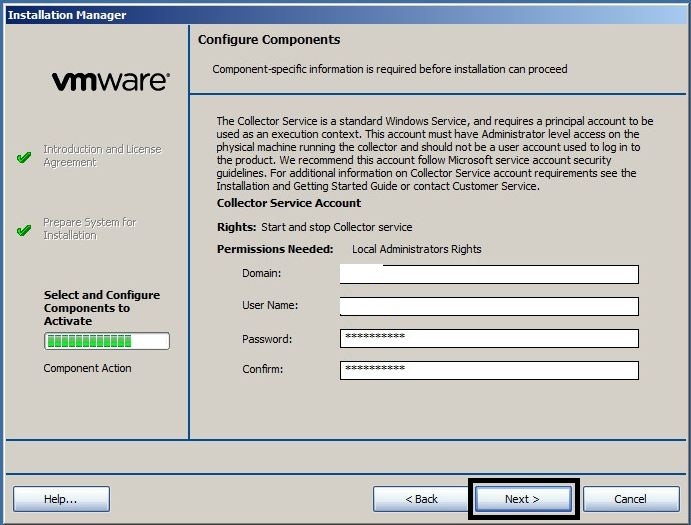 Upgrade the vCenter 5.5 server object “Agent State” by selecting the object and pressing the “Upgrade Agent” option from right mouse click. 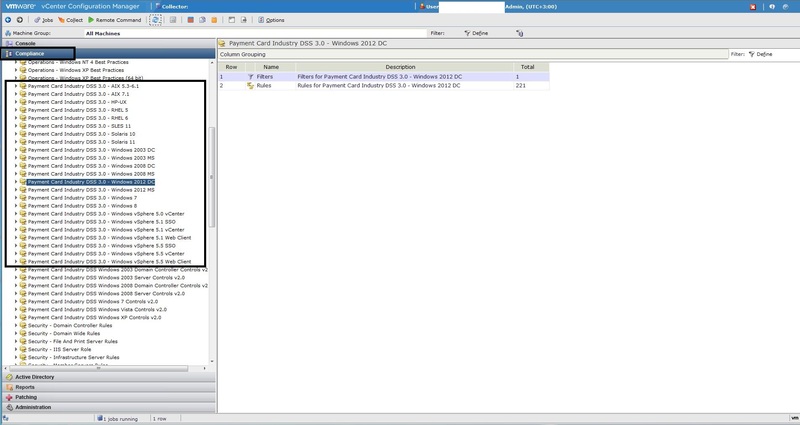 Verify that the vCenter server object now shows Type “2012 R2/vCenter” and the “Agent Version” is “5.7.2.44”. 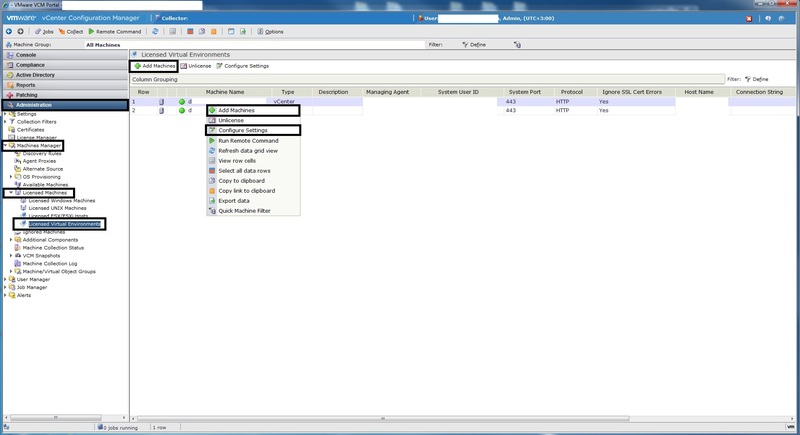 Also add the separate vCenter Database server (if applicable) using the “Add Machines” option. Then visit the “Administration”, “Machines Manager”, “Licenced Machines”, “Licenced Virtual Environments” page. 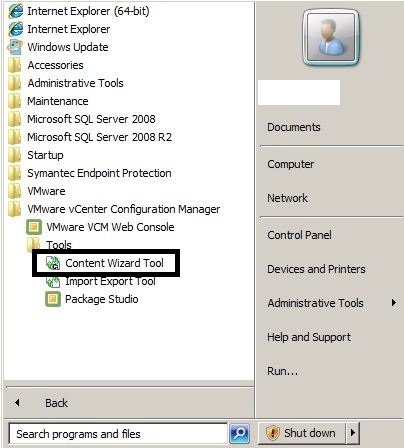 Check that each vCenter has an entry with the “Type” as vCenter. 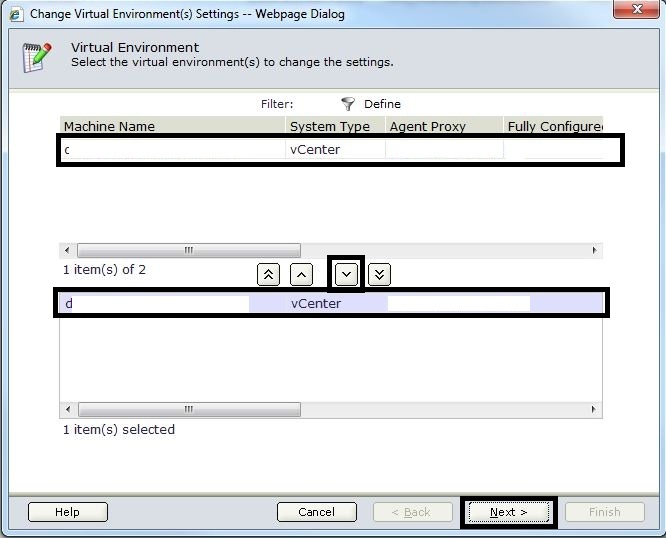 Also ensure that the “Green” LED is present for each vCenter. 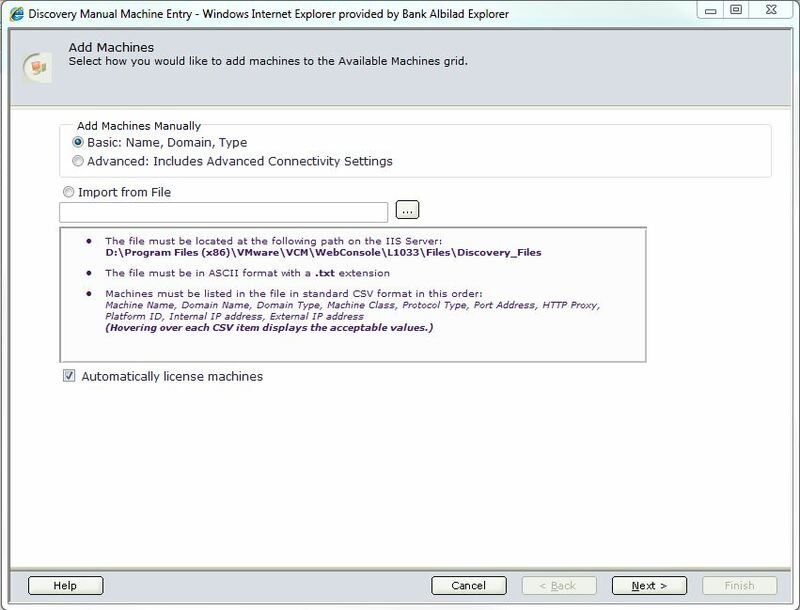 If any vCenter entries are missing, use the “Add Machines” object to add them. 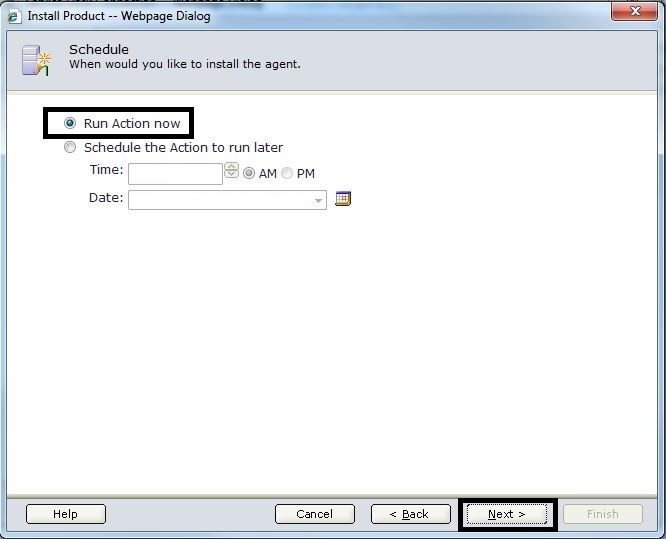 Also use the “Configure Settings” object to update the “Managing Agent” settings.